The year was 1939, and a 20-year-old Oakland athlete named Sal DeGuarda was living a dream. He was performing in the Billy Rose Aquacade at the Golden Gate International Exhibition on Treasure Island. The thrill of swimming with icon Esther Williams was something he would never forget. But there was another lady that captured his fancy, and continues to hold it today. DeGuarda’s dream, in his golden years, is to rebuild the 80-foot sculpture called Pacifica that was erected for the fair as a symbol of Pacific Rim unity. “That statue should never have been torn down,” says DeGuarda, who watched the Navy destroy the grand lady a year after the Expo ended. “She was the most significant piece of art at the World’s Fair,” he laments. 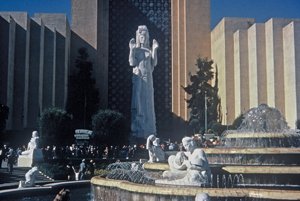 He compares Pacifica to the Statue of Liberty in New York and envisions restoring her to prominence on Treasure Island. Pardon the pun, but isn’t rebuilding this statue a monumental project for an 87-year-old man? Not if you’re a guy like DeGuarda. A contractor for more than 60 years, he’s rebuilt it a thousand times in his mind. “I go to sleep every night thinking about this statue,” he admits. Now he’s hired a fundraiser and come up with a plan and a pamphlet for soliciting donations for his Treasure Island project. There’s also the matter of convincing the Redevelopment Agency on Treasure Island that the statue should be rebuilt. “We have to do a little maneuvering to get them off their rear ends,” laughs DeGuarda, who has met with officials and knows how slowly the wheels of bureaucracy can turn. This entry was posted in People Profiles. Bookmark the permalink. Is the “Pacifica” statue protected by any copyright infringement? Can anyone be in trouble for using the name Pacifica and the image of the statue for a group name and logo or an organization?